The geography of poverty in Toronto is changing. It is shifting from the downtown core to the suburbs. The Daily Bread Food Bank's latest report shows demand for food banks falling downtown and climbing — by 45 per cent since 2008 — in Etobicoke, North York and Scarborough. Agencies are scrambling to meet the increased demand. Though the location is different, the human stories of struggle are similar. Blue Door is the only men's shelter in the area. Rogers lived here four years ago, to get clean from drugs and alcohol. He spent a lifetime running from his childhood demons. "It was a tough go, my dad was an alcoholic," Rogers said. "That made it a lot tougher. There was violence, when he got drunk, towards my mom." School wasn't much of an escape, as Rogers and his four siblings were teased about their hand-me-down clothes and rubber boots. Rogers said he wore the boots in summer too. "There was no running shoes or anything, it was whatever we could put on our feet," he said. "They'd taunt us [about our clothes] but we stuck together. When the taunting started, that's when the fighting started. It doesn't make you feel good but at least it stops them because they don't want to get hit again." At 15, he began drinking and doing drugs. By 16, he was jailed for assault. But Newmarket was booming, and there was always work. Rogers got jobs in construction, laying phone, television and hydro cables. "I had a lot of high-profile jobs. I was the foreman, I was making big money, I was making $60,000-$70,000 a year. But the drugs and alcohol always slipped in." By the time Rogers was in his 50s, he was abusing cocaine. His partner kicked him out, and he began couch-surfing. He lost his car, too. "I was embarrassed every time I had to walk somewhere. To me that's an embarrassment," he said. "People go by and they say, 'Well, that guy can't afford to buy a car.'" That was around the time Rogers ended up at the Blue Door Shelter to get clean. The building for men has only 30 beds. And it's the only men's shelter in the York region, a growing area with a population of about one million. Like Rogers, most of the men who pass through the shelter's doors struggle with addiction. By the time he was at Blue Door, Rogers had never written a word of poetry before. He was surprised to find that's how it came out. "Here's one here, I really like. It's called, A Coffee At Two In The Morning. It's about a struggling addict trying to fight the urge of using the drug," he said. Dammit, I say to myself, as I lay here awake. Restless runs thru my body. I feel like it's taunting me, wanting me to get up and break all the rules. Like many homeless people, Rogers hadn't done taxes for years. At the shelter, someone helped him finish them, and he got a return of a couple of thousand dollars. It was enough for a car. Now, he's got wheels again, a 13-year old Dodge Neon he repairs as needed. Rogers has been clean for four years. He began volunteering for LifeCorps Food Share, a non-profit group that sorts donated food. LifeCorps used to be in Aurora, on the same road where Rogers' former drug dealer still lived. 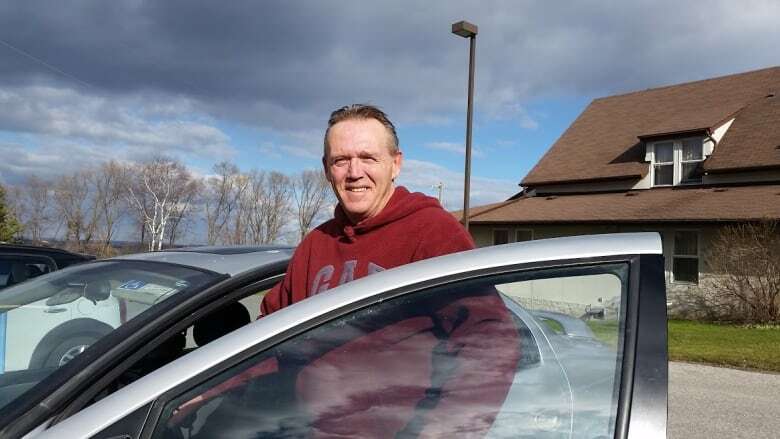 Every time Rogers drove out to volunteer, he would stop at the intersection between the two places, and make a choice — turn left or turn right. Every day, he made the right turn, to spend the day sorting food, his own road back to recovery. When Rogers drives through Newmarket today, he can pick out who's homeless, adding up details most people wouldn't see. You think that person's walking, out for a walk, and then, you constantly see them people, and you say, 'Gee, they walk an awful lot.' And then a couple of times you see them carrying bags — and then you know." At 60, Rogers is on long-term disability — 40 years of drug use has taken a toll. His volunteer work, along with his poetry, keeps his mind busy. A coffee at two in the morning, that's my relief. (recovery) It's called recovery. And it feels really good. Fifteen minutes go by. And the cravings have settled down. I shook the monkey off my back one more time. Man, this is the worst I have felt. I know it's a battle within. A fistfight would not be worse. I have to be realistic, I brought on this curse. Relief I am feeling. My self-esteem is coming back. A coffee at two in the morning tastes great. I'm relaxed. People are being turned away from shelters like Blue Door, because of the growing demand and the lack of space. Here's a rundown of the numbers Blue Door is facing. CBC Toronto's Sounds of the Season (SOTS) is our annual charity drive in support of local food banks. Please visit our website for details on the December 4 event, and to find ways you can donate. Anyone wishing to get a copy of Rogers' book, The Dark Road: A Book Of Poetry, can email dlrrogers180@gmail.com.